Does anyone have any experience with the english-language/polish-printed book, Early Medieval Swords from Central and Eastern Europe: Dilemmas of an Archeologist and a Student of Arms by Lech Marek, ISBN: 83-229-2624-3 ? I saw someone posting a few copies over at swordforum and on ebay and they perked my interest, as any new books on my favorite topic do. Much of the content that I was able to view seemed to draw heavily on others such as Geibig, yet that is to be expected I suppose. Anyone have any recomendations on how good of a reference this might be? This book is in our Bibliography (http://www.myArmoury.com/books/item.php?ASIN=MYID567) and I know Nathan has a copy. Hopefully he'll chime in. I bought my copy from Abe Books. Looks like they have one copy left. My copy of this book finally arrived from the dark side of the moon. (actually it came from a bookseller in Poland, but it took its time getting here) I've been reading through it and I have to agree, it's an excellent resource. 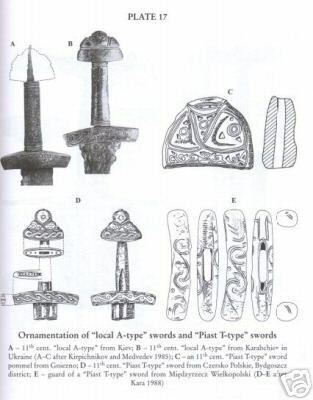 It may in fact change a lot of perceptions about what we consider to be characteristically "viking" sword designs. The lobed pommel style of hilt seems to have been far more wide spread and generally accepted than I personally thought.